Some playoff series aren’t just about the basketball. It’s about a rivalry that has been brewing for years, which is why there’s no surprise to see fights and low blows in the playoff series between the Los Angeles Clippers and the Oklahoma City Thunder, usually involving someone trying to hit Blake Griffin who has been fighting all year long against provocations, not always working out the best for him. Griffin and Serge Ibaka have something special going on. 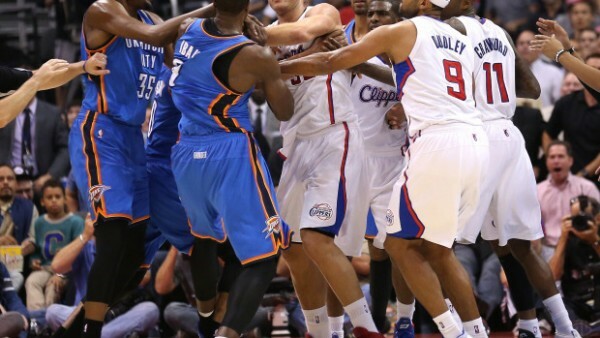 It seems like the Thunder’s big man has a knack to hit Griffin, or at least try to, where the sun doesn’t shine. Why? That is his way of getting inside his head. Griffin actually came out quite bloodied in his face during game 3 in the series, although this time he was the one who hit his face into Ibaka’s elbow instead of the other way around. The Thunder are no longer the league’s darlings like they were from 2010-2012, culminating in the 2012 NBA finals when they disappointed by losing to the Miami Heat. Since then they’ve been in the national media attention, but Kevin Durant and his teammates are no longer likable up and coming youngsters, but a team that is probably viewed as the most talented in the league but has flaws that they can’t seem to overcome. Scott Brooks being a head coach that doesn’t seem like he has too much offensive IQ has something to do with it. Russell Westbrook, like Rajon Rondo, for similar and separate reasons, will never win the love of the masses. Serge Ibaka is an excellent blocker and mid-range shooter, but his dirty habits might be hidden from the eyes of referees, but cameras and YouTube videos catch ’em very well indeed. Kendrick Perkins has the Westbrook – Ibaka combination only without any offensive ability and sometimes actually being a liability on the court. Steven Adams, as some of his teammates have mentioned, often plays and behaves like he was raised by a pack of wolves. The Thunder aren’t just a small-market team with a lovable superstar fighting the odds. They’re favorites against anyone they play, which immediately hurts the neutral popularity factor. Durant is another story. He is now the NBA’s MVP. The amount of technical fouls he has gotten over the last couple of years shows us he isn’t the nice little kid waiting for LeBron James to retire so he can take over. He is lethal on the court, but he is also arrogant at times both on and off it. He expect to be treated like a superstar by the referees, which he is getting in this series. He’s a great player, but there’s nothing naive or sweet about him anymore. The Clippers have their flaws in terms of what people like or not. Flopping, mostly directed at Chris Paul and Blake Griffin, always rallied people to a cause. Doc Rivers might be a well respected NBA head coach, but the way he left things in Boston didn’t win him too many fans. There’s negative emotion pouring into this series from the outside – national media and other mediums, which help fan the flames. And it comes down to the court as well. This has been going on between these teams for the last two or three seasons. Since the Clippers have become a serious force in the West as well. The Thunder don’t handle that challenge all that well in terms of behavior, although they seem to be doing OK most of the time basketball-wise. Finally meeting in the playoffs, there isn’t going to be much of a change, especially if this series goes to a game 7.